This situation was raised on December 4, 2017, by a client in a large mid-west medical center. A nurse has a note from his primary care physician indicating that he should work the day shift because of impairments (i.e., not disabilities) related to anxiety, depression, and a sleep disorder. He is currently attached to an emergency room position on a 3-day per week, 12-hour night shift. The employee delivers the physician’s note to the human resource department and verbally requests a reasonable accommodation. By doing so, he indicates that without an accommodation, he is no longer a qualified individual for the position to which he is attached. As presented, his is a valid request for a reasonable accommodation. This step obligates both himself and his employer to engage in the interactive conversation with good faith. An initial step in the interactive process includes an important face-to-face exploration of the relationship between each unique impairment identified by the physician and each unique essential function of the job to which the nurse is attached. Note that in the above paragraph I specifically said “impairment” and that I did not say “disability.” One purpose of early-on interactive discussions is to identify the work-related disability which may qualify the nurse for consideration of reasonable accommodation. Don’t use the word “disability” casually: the absence of a diagnosed impairment may technically relieve the employer from responsibility for an accommodation. However, a misplaced assumption that the employer has no responsibility for consideration of accommodation may lead to a costly EEOC charge of “failure to accommodate”. And the presumption of a disability by the employer may violate the third prong of the definition of disability under Title I of the Americans with Disabilities Act. This initial conversation is a high-value step in the search for an equitable solution; it is best handled by a trained reasonable accommodation program manager. The interactive conversation will yield better results if the employer representative and the employee agree in advance that the mutual goal or destination is to remove the barrier to the nurse’s status as a qualified individual. 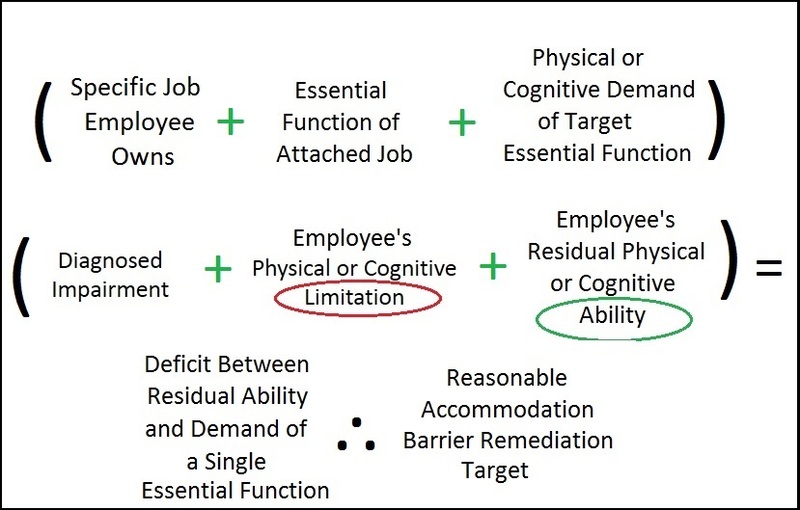 The barrier is his reported inability to safely and effectively carry out the physical, emotional and cognitive demands of each essential function of the job to which he is attached. Base the journey on a good road map describing the problem: use an accurate list of the position’s essential functions which has been extracted from a formal essential function job analysis. In this graph the plus symbol means “knowledge of”, the bracket symbols group related information, and the three-points symbol means “therefore”.